The Sanchi tanker, registered in Panama, collided with the CF Crystal some 160 nautical miles off the coast near Shanghai on Saturday evening, the Ministry of Transportation said in statement on Sunday. 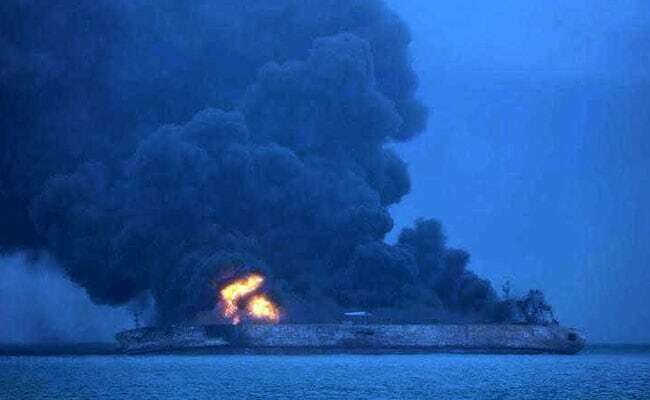 BEIJING: A tanker carrying Iranian oil and run by the country's top oil shipping operator was ablaze and spewing its cargo into the East China Sea on Sunday after colliding with a Chinese bulk ship, the Chinese government said. The Sanchi tanker, registered in Panama, collided with the CF Crystal about 160 nautical miles off the coast near Shanghai on Saturday, the Ministry of Transportation said in statement. The tanker's 32 crew members were missing. It was sailing from Iran to South Korea, carrying 136,000 tonnes of condensate, an ultra light crude. That is equivalent to just under 1 million barrels, worth about $60 million, based on global crude oil prices. "Sanchi is floating and burning as of now," the ministry said. "There is an oil slick and we are pushing forward with rescue efforts." It had sent four rescue ships and three cleaning boats to site by 9 a.m. (0100 GMT), it added. South Korea has also sent a ship and helicopter to help. A Korean Coast Guard official confirmed the tanker was still on fire at 1 p.m. (0500 GMT). He declined to be identified as he was not authorised to speak to the media. The Chinese government gave no details of the size of the spill. The Foreign Ministry said in a separate statement the cause of the incident was under investigation. The Sanchi tanker, leased by Hanwha Total Petrochemical Co Ltd, had "valid foreign insurance", Iranian oil ministry spokesman Kasra Nouri told Iran's state television. Sanchi collided with CF Crystal, registered in Hong Kong, which was carrying 64,000 tonnes of grain from the United States to China's southern province of Guangdong, the government said. CF Crystal's 21 crew members, all Chinese nationals, have been rescued. It was due to arrive on Jan. 10, according to Reuters ship tracking data. CF Crystal, which was built in 2011, suffered "non-critical" damage, China's transport ministry said.